Business Roofing for moderate to steep pitched roof uses roofing types such as asphalt shingle, clay tile, concrete tile, metal, just depends mostly on what the needs are of the business are: Restaurant or bakeries will need fire retardant roofing. Windy areas along coastal waters will need a roofing material designed to repel ocean breezes. Business roofing for low pitch or flat roofing use Tar and Gravel or BUR (Built Up Roof), Modified Bitumen, Rubber Membrane (EDPM), Metal panels, TPO (single-ply membrane) and waterproof roof coatings. Most flat roofs have a minor pitch to slowly drain moisture to its preferred drain system so during repairs this pitch should be retained. The flat roofs will also place environmental building equipment on the rooftop. Business roofs are generally smaller buildings with less open space surrounding them than a Commercial or Industrial one. The environmental impact of overhanging Trees drooping fruit, nuts, leaves, needles, and broken branches all of which damage or deteriorate roofing material. Roof debris will clog gutters or flat roof drains and perhaps cause flooding on the rooftop. Trees can also be a highway for critters or criminals to access your roof. The best preventive maintenance for a rooftop is to keep the trees trimmed back. 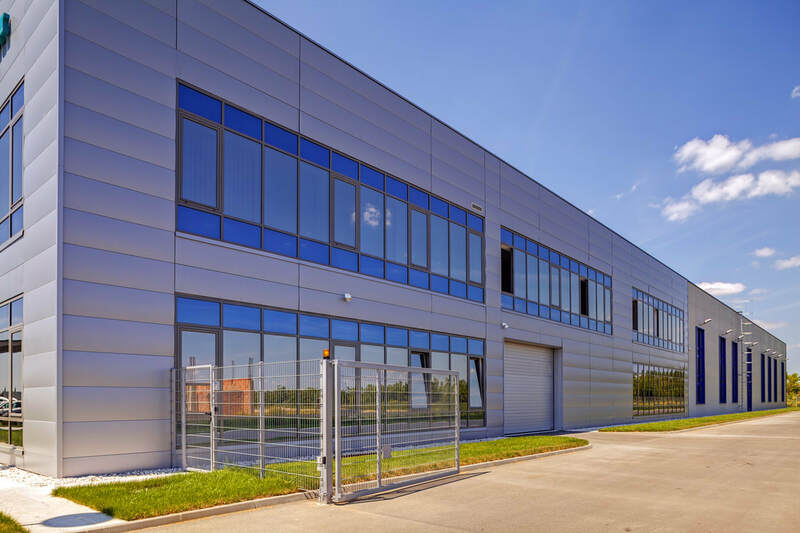 Commercial Roofing needs to cover large spaces and flat roofs are the best application because they require less building material to provide a well-functioning roofing system. Commercial Flat roofing styles include: Tar and Gravel or BTU (Built Up Roof), Modified Bitumen, Rubber Membrane (EDPM), Metal panels, TPO (single-ply membrane) and waterproof roof coatings sprayed over insulated roof decking. Flat roofs mount all H-VAC building equipment on top of the roof. All roof penetrations must be properly sealed to avoid leaking or ponding on the rooftop. Care must be taken to follow the roofing manufactures installation recommendations exactly for specific roofing systems- including preforming regular maintenance recommendations. Faults on a commercial roof can sometimes be fixed easily, for example debris on the roof may be causing ponding, drains for water removal could be blocked, and vent or pipe penetrations may need caulking. Other problems take more experience roofers to track down elusive leaks or problems (like mold infestations), such as: Leaks that are hard to discover may require layers of the roof to be peeled back to find the split in the membrane, clogged drain pipes may need to be disassemble to be cleared, and Pest control may need to be engaged to catch critters that may be chewing holes in the membrane or slipping into venting looking for a home. Industrial roofing is needed for manufacturing businesses that require strong roofing material that will hold up to byproducts of chemical processes, heat output, steam or vapor output. 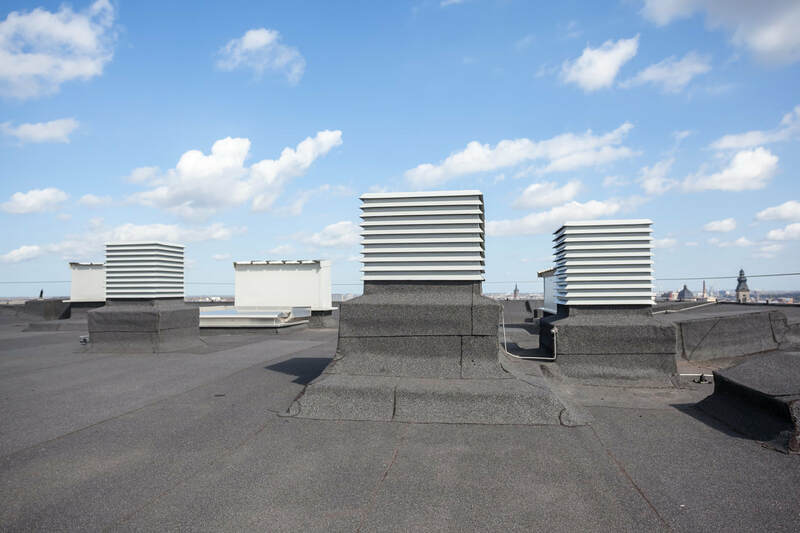 Some industrial roofs may be designed to hold heavier environmental equipment placed on the roof to filter any released smoke or vapors. Nothing that would weaken the roof’s structure should be done during repairs or additions. Several more roof penetrations than the norm appear on Industrial Roofs. Such as, Skylights to bring natural sunlight to dark interior spaces, filtering equipment for chemical processes and more roof drains for the additional flow from a large expansive roof span. The type of roofing that works well in industrial roofing are flat roof systems of Tar and Gravel, Modified Bitumen, TPO single-ply rubber membrane and metal roofing for low slope roofs. Asphalt shingle composition is a base of fiberglass reinforcing mat which is soaked in bitumen (tar) for waterproofing and then coated on top with ceramic granules. The ceramic granules give the shingle strength, color and ultra-violet light blocking coating. Asphalt Shingles sometimes called composition shingles are designed to shed water quickly on moderate to steep pitched roofs. Asphalt shingles cover about 80% of all pitched roofs in the USA- they are the most affordable type of roofing material available that will last a few decades or more with the premium type. The most affordable are the 3-Tab shingles which have a life expectancy of about 20 years. They are thinner and less expensive (30 to 40 percent less) than the premium type. Since most people stay in one home for an average of 11 years, 3-Tab shingles meet their needs and are the still by far most popular shingle today. There are different qualities of shingles that rank their life expectancy from 20 years to life time warranties. The thicker 3 dimensional or Architectural are a multi-layer laminated shingle that produces a 3-dimensional effect on a roof. Premium shingles are a further upgrade to make the shingle look like more expensive roofing materials, such as cedar and slate and sometimes their costs rival the real thing (wood and slate). The roof is a system comprised of many components, with just as much importance as the shingles. There is the water proofing ice shield, the water-resistant underlayment (felt), skylights, the ventilation, shingles and the flashings- all are important to the success of a long-life system. Manufacturer’s warranties usually run 25 years for 3-Tab and 40 to 50 years for architectural. 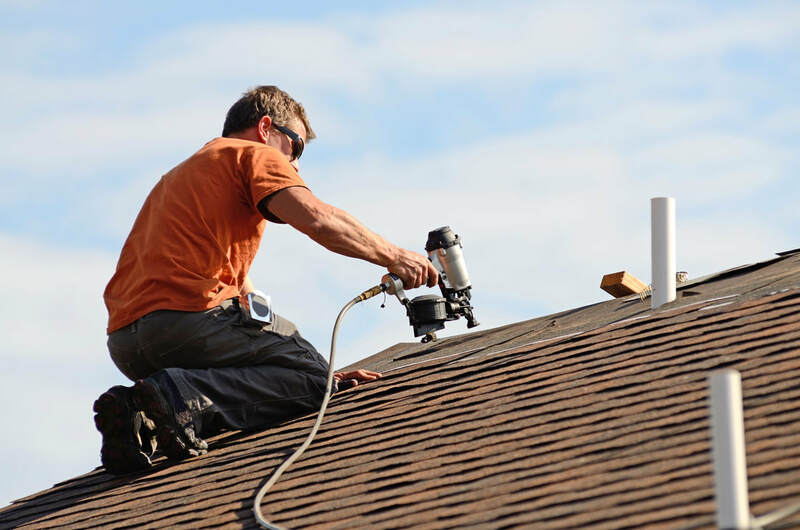 Roofing repairs and installations are also dependent upon the roofing contractor providing services that follow all roofing manufacture guidelines as well as government regulations. 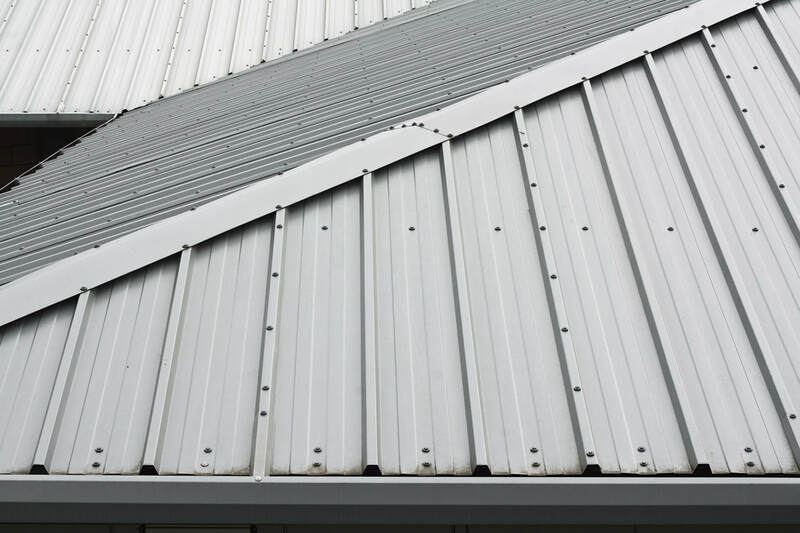 Some building managers with low to high slope roofs use metal roofing as a way to get a durable long-lasting roof that is both affordable and very quickly installed. Metal roofing is light enough to put over old roofing without the added expense or time necessary for pulling off the original roofing. Plus, it comes in many styles and colors and easily coated after installation to provide additional waterproofing, anti-rust and UV protection. You can have your metal roof installed with exposed or hidden fasteners. Metal roofing is purchased in sheets or shingles. Depending on the quality of material, the durability ranges from fair to extremely durable and the cost can be moderate to very expensive. Aluminum, steel, copper and zinc are the most common types of metal shingles. Also, they have a wide price range with copper and zinc being on the high end. They require specialized skills and equipment to install. Life expectancy is 40 to 70 years depending on type and skill of installation. The diamond in the rough of roofing systems, and perhaps the most expensive option available- close to 5 times the amount of traditional methods. Slate has a very beautiful unpolished stone look with a wide range of colors, such as gray, green, purple, black, red, and mottled tiles that have several colors mixed in. Slate roofs can easily last 175 years or more. We understand this well from centuries in passing at its earliest widespread usage in the 13th century Europe. Slate roofs can easily last 175 years or more. Slate roofs require an expert to install for several reasons: Because slates can’t be walked on, roof scaffolding must be used. Slates that are walked on may break apart immediately or 5 to 10 years later- giving rise to a roof that does not shed water. 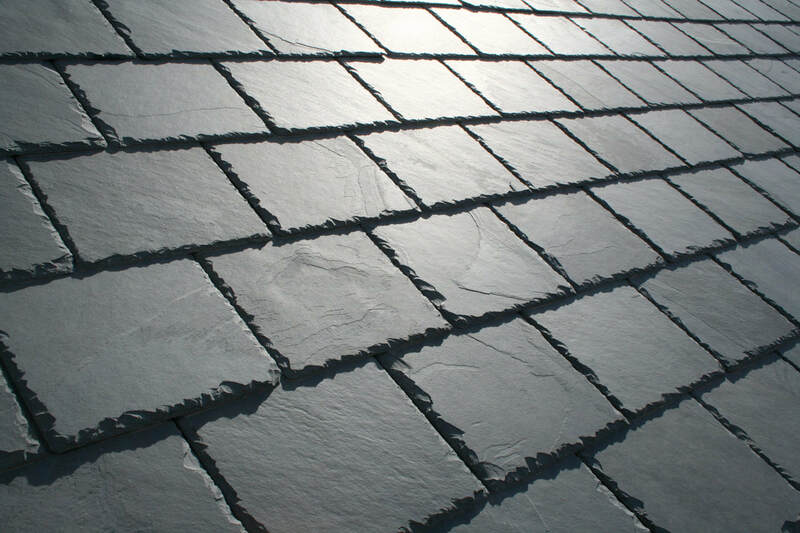 Those who want a slate roof should get proof of the roofer’s expertise with slate as well as learn a little about the process themselves so they can oversee the project. Also, the roof must be structured to handle the heavy weight (800 to 1,500 lbs. per 100 sq. feet) or roof collapse at some point will befall the inhabitants. TPO is an acronym that means Thermoplastic Polyolefin membrane that softens when heated and hardens as it cools. This allows seams on a TPO roof install to be heat bonded with a hot air welder. 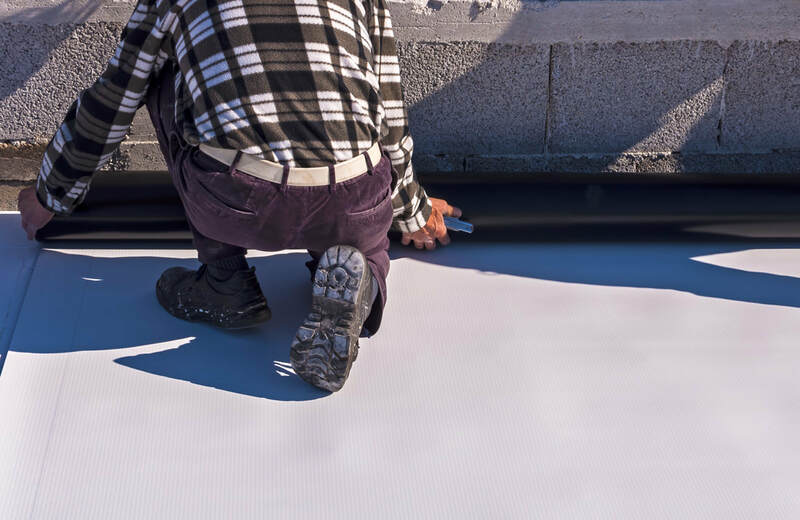 TPO roofing is a single-ply membrane that is either fully adhered to the flat roofing deck, tied down with screw in fasteners, ballasted with gravel or plate bonded. All seams and flashings are recommended to be sealed with hot air welding equipment for the most permanent type of bonding. TPO membranes come in varying lengths up to 100-feet-long and 6 to 12 feet wide. They are typically 40 to 100 mils thick with a highly reflective white top to prevent solar gain in the building below. Quality varies greatly from one manufacture to another and price isn’t always a good indicator. This is where an experienced roofing contractor can help explain the differences in TPO membranes and which manufacturer has held up well in Blacksburg, VA climate. When the TPO membrane ages, the top layer of it will contract, cracks or stretch marks appear, and generally become misshapen. If the roofing membrane has numerous cracks and has pulled away from the seams, then it is time to replace the membrane. Most roofs can handle two layers of membrane buy it may be best to know if there is suspected moisture damage underneath a inspection should be made. A core sample could be taken to inspect insulation for mold or moisture damage and the need for replacement determined. The wood framing may have also developed rot and need repair. The Tar and Gravel flat roofing system or Built-Up-Roofing is manufacture on the roof beginning with coal tar heated in a kettle or hot tanker to a temperature high enough to be easily spread. The tar is applied to the roof surface with a mop or spreader to be followed with a layer of felt or fiberglass fabric (produced in a standard width of 36 inches). The process is repeated till you get the number of layers desired (four ply roof means the roof has four layers of roofing membrane). The final layer of tar will be topped with enough gravel to cover the entire roof surface so your not walking of sticky bits of tar for any maintenance issues. Also note that this is not the same as what a paving contractor would do on a driveway. We have been installing Tar and Gravel Roofs for about 150 years in this country. 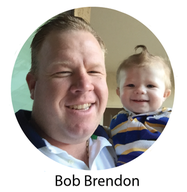 The average lifespan is 30 years with periodic maintenance. Some roofs are still protecting dwellings beyond 50 years- all depends on environment and skill of the original install. Warning: Hot tar is very hazardous to work with so this type of roof should always be done by a professional besides. These roofs are not normally done on residential properties because of the strong smell associated with Tar. This roof is self-healing: At temperatures above 70 degrees, the tar begins to soften and flow into lower areas, such as small cracks or punctures within the felt or fiberglass fabric layers. Somewhat like BUR roofing except the felt layers between Tar applications are of a polyester or fiberglass impregnated with bitumen (a black viscous mixture obtained naturally or a petroleum distillation residue). No longer does tar have to be spread between the felt layers- its already there. 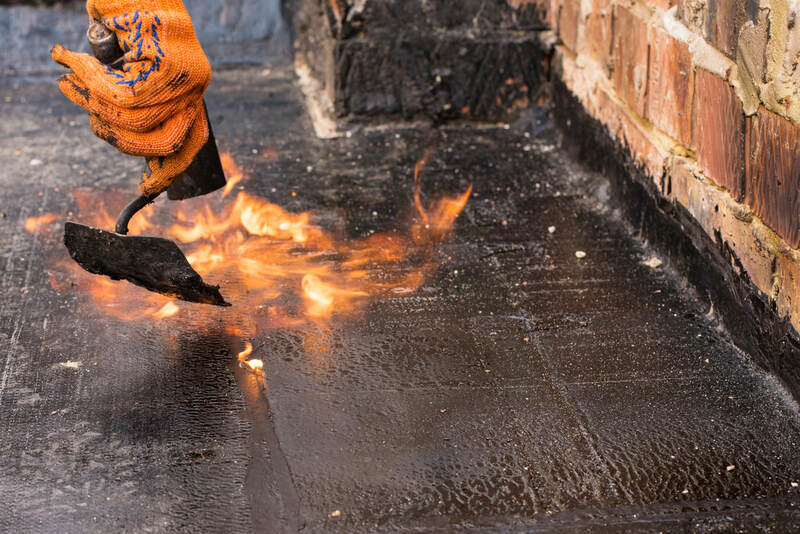 Modified Bitumen roof are installed by rolling out the roofing material as its being heated with a blow torch to allow the material to adhere firmly to the roof surface. There are also peel and stick membranes available. This roof is stronger and more resistant to weather than the BUR roof and is longer preforming. Modified Bitumen membranes are strong and resist tearing because they are reinforced with fiberglass, polyester or a combination of the two. Topping off the roofing membrane with gravel is not done because they already have a mineral based granule surface that protects the membrane from UV rays and minor impacts. Made of natural rubber or EPDM (ethylene propylene diene monomer) rolled carpet like into a flat membrane available in two colors white or black. Both types of membrane material do resist sun damage. The white color is about 30% more expensive due to its heat-reflecting properties which is better for southern climates. Since this is like laying a quilt over a roof, it’s subject to wind damage- even going for a liftoff in high wind. The material has to be mechanically fasten with long screw like anchors, adhesive, or placing a layer of gravel on top to keep the public safe from large flying sheets of rubber. Developed in the late 1980’s for the automotive industry Polyurea liquid has spread to a wide array of other applications in waterproofing tanks, parking garages, reservoirs, tunnels, as a joint filler and basements. 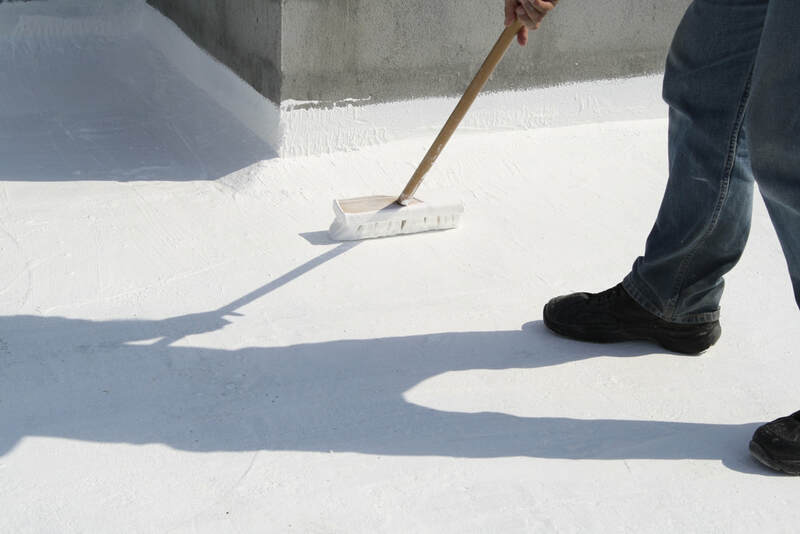 Lately it is being used as a roofing waterproofing agent sprayed over other roofing materials to stop leaks and renew the strength of the roof. These coatings form a seamless monolithic waterproof coating over many surfaces to protect against chemical exposure, leaks, rust and erosion. It will also stretch and shrink with the surface during climate change which makes it very useful in surfaces exposed to the weather. Manufactures have had 3 decades to improve Polyurea formulas to be more durable and longer lasting. Some Formulas will dry within 4 to 6 hours- a big advantage when you need a protected structure back in service quickly. 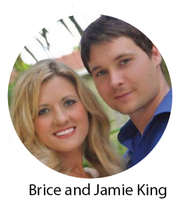 We have referred them to several other business owners and will continue to do so. 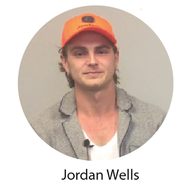 Get more roofing business.